Download "If you would like to purchase an Access Code directly from the publisher, proceed to step 1." 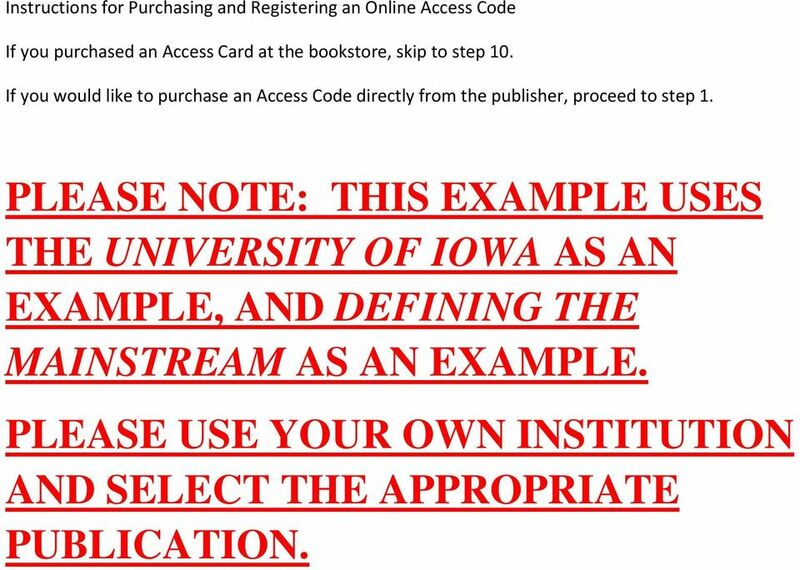 1 Instructions for Purchasing and Registering an Online Access Code If you purchased an Access Card at the bookstore, skip to step 10. 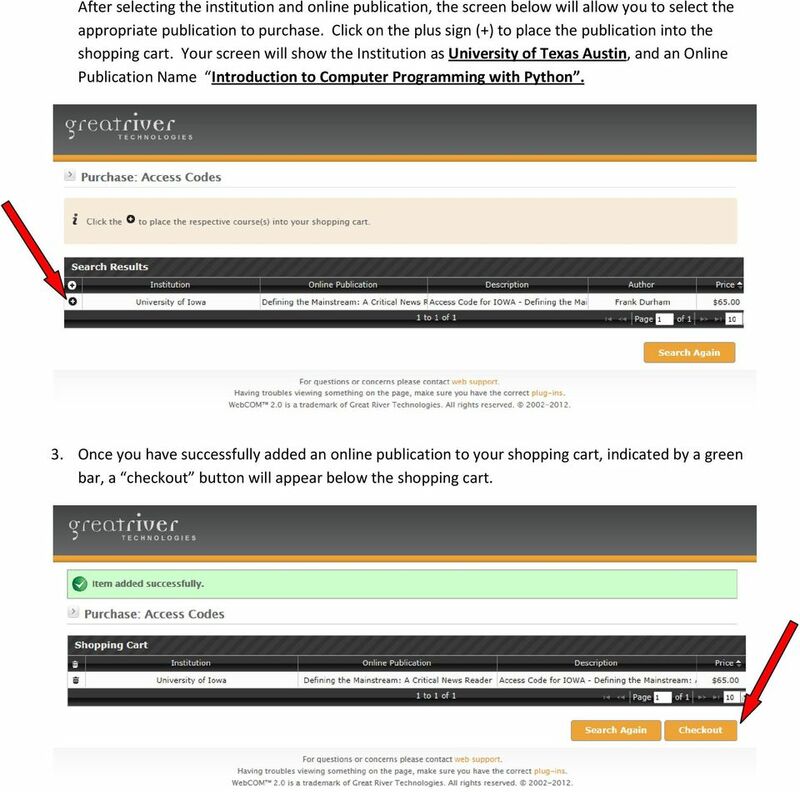 If you would like to purchase an Access Code directly from the publisher, proceed to step 1. 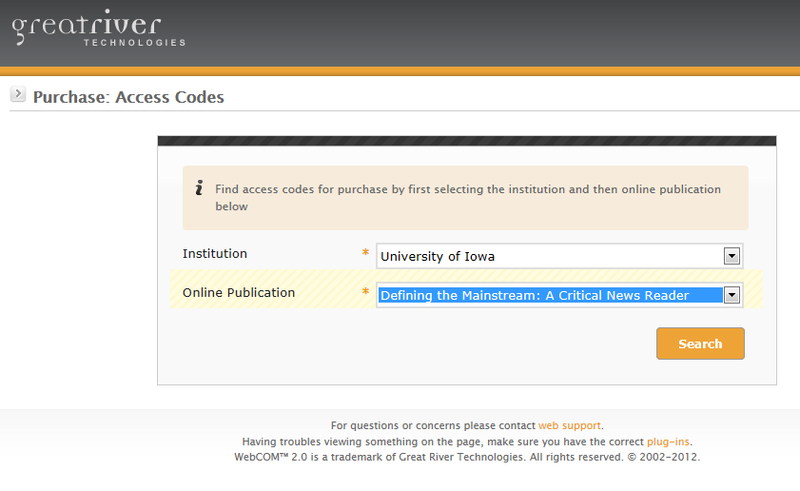 PLEASE NOTE: THIS EXAMPLE USES THE UNIVERSITY OF IOWA AS AN EXAMPLE, AND DEFINING THE MAINSTREAM AS AN EXAMPLE. PLEASE USE YOUR OWN INSTITUTION AND SELECT THE APPROPRIATE PUBLICATION. 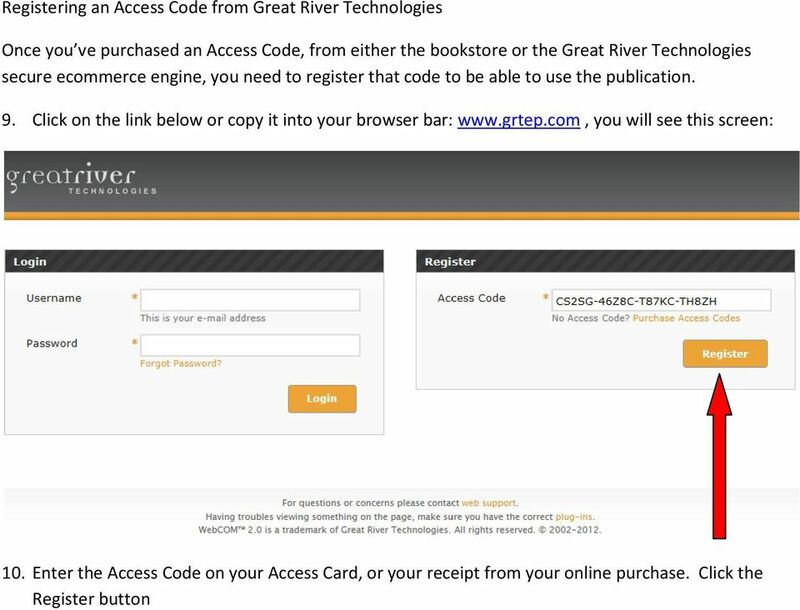 2 Purchasing an Access Code from Great River Technologies 1. Click on the link below or copy it into your browser bar: you will see this screen: 2. 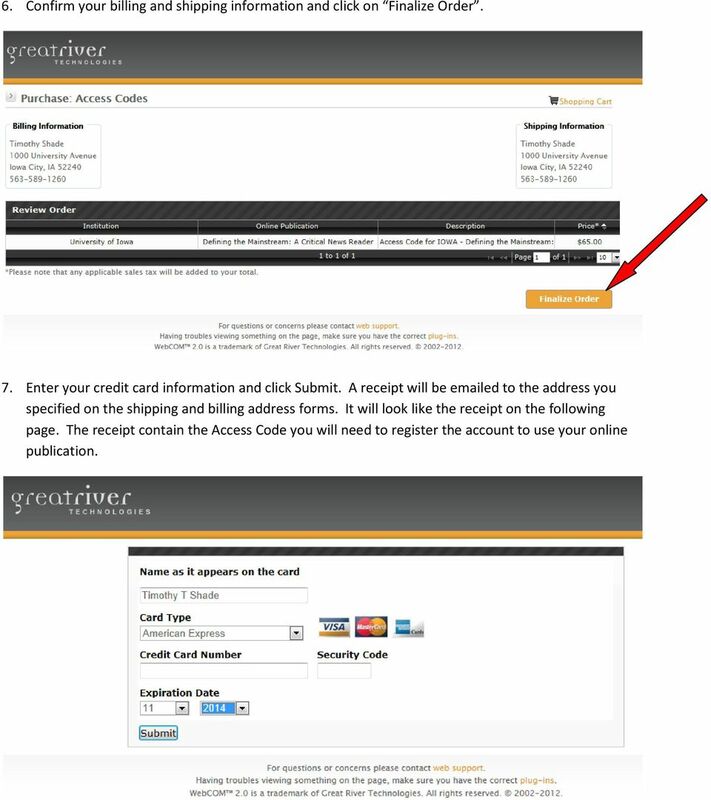 Click on the Purchase and Access Code link within the Register box, underneath the Access Code entry field. This will bring you to the Great River Technologies secure ecommerce engine. 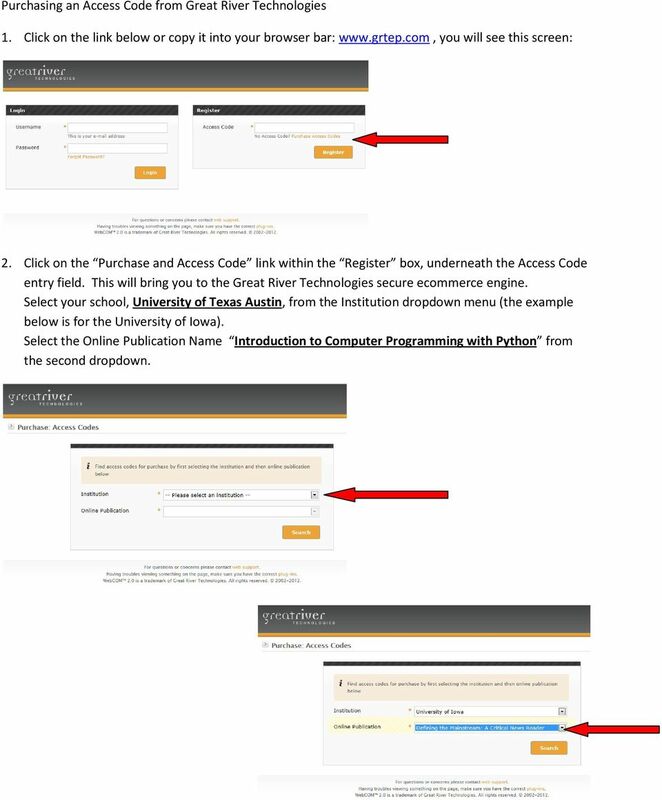 Select your school, University of Texas Austin, from the Institution dropdown menu (the example below is for the University of Iowa). 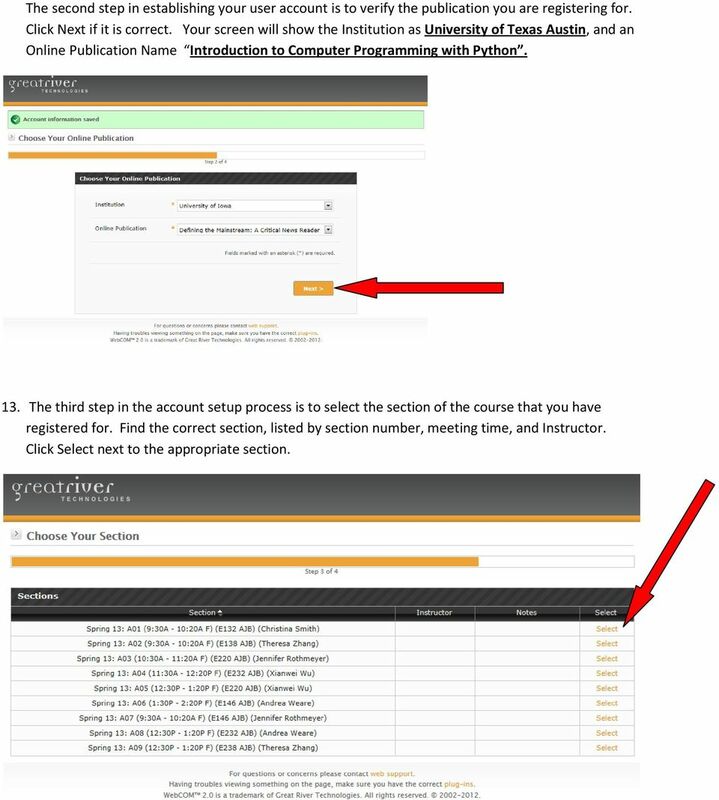 Select the Online Publication Name Introduction to Computer Programming with Python from the second dropdown. 3 After selecting the institution and online publication, the screen below will allow you to select the appropriate publication to purchase. Click on the plus sign (+) to place the publication into the shopping cart. Your screen will show the Institution as University of Texas Austin, and an Online Publication Name Introduction to Computer Programming with Python. 3. Once you have successfully added an online publication to your shopping cart, indicated by a green bar, a checkout button will appear below the shopping cart. 4 4. 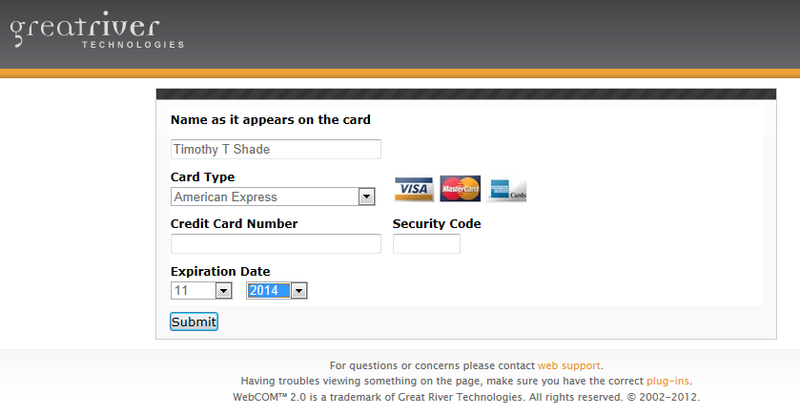 Clicking on the Checkout button will initiate the following screen. 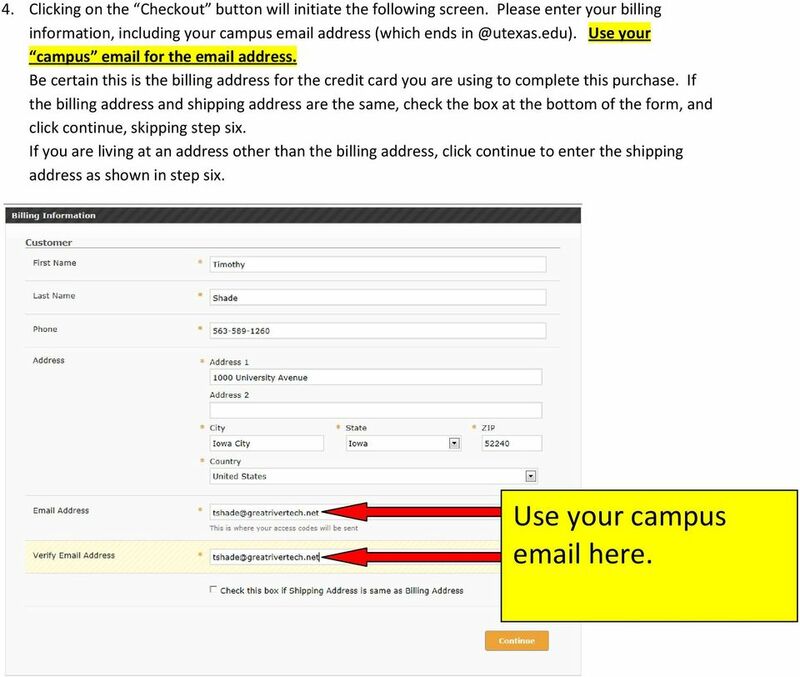 Please enter your billing information, including your campus address (which ends Use your campus for the address. Be certain this is the billing address for the credit card you are using to complete this purchase. If the billing address and shipping address are the same, check the box at the bottom of the form, and click continue, skipping step six. If you are living at an address other than the billing address, click continue to enter the shipping address as shown in step six. Use your campus here. 5 5. 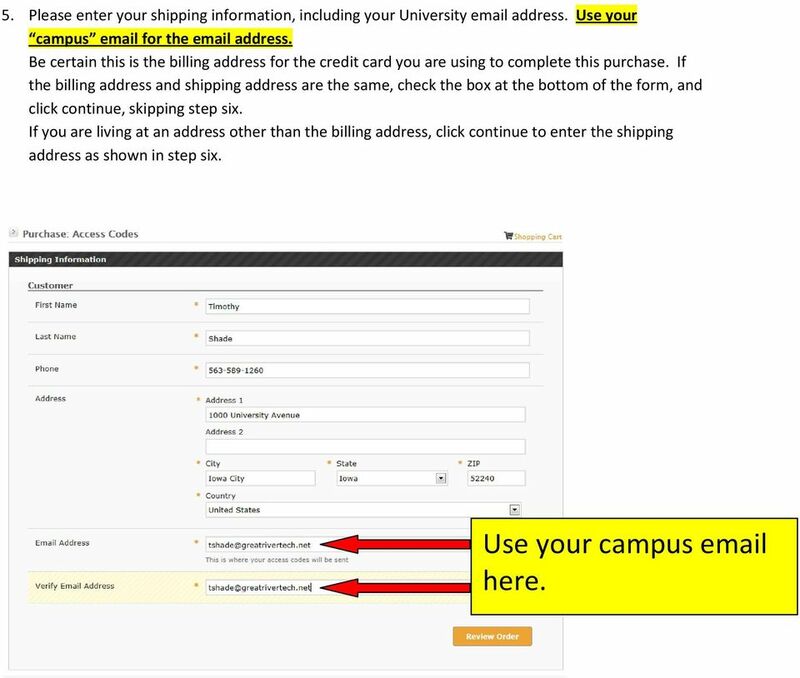 Please enter your shipping information, including your University address. Use your campus for the address. Be certain this is the billing address for the credit card you are using to complete this purchase. If the billing address and shipping address are the same, check the box at the bottom of the form, and click continue, skipping step six. If you are living at an address other than the billing address, click continue to enter the shipping address as shown in step six. Use your campus here. 6 6. Confirm your billing and shipping information and click on Finalize Order. 7. Enter your credit card information and click Submit. A receipt will be ed to the address you specified on the shipping and billing address forms. It will look like the receipt on the following page. The receipt contain the Access Code you will need to register the account to use your online publication. 7 8. 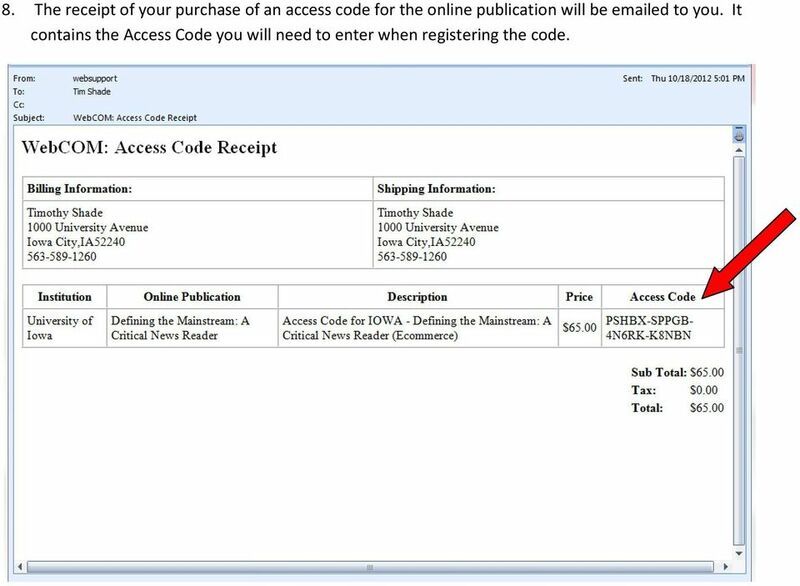 The receipt of your purchase of an access code for the online publication will be ed to you. 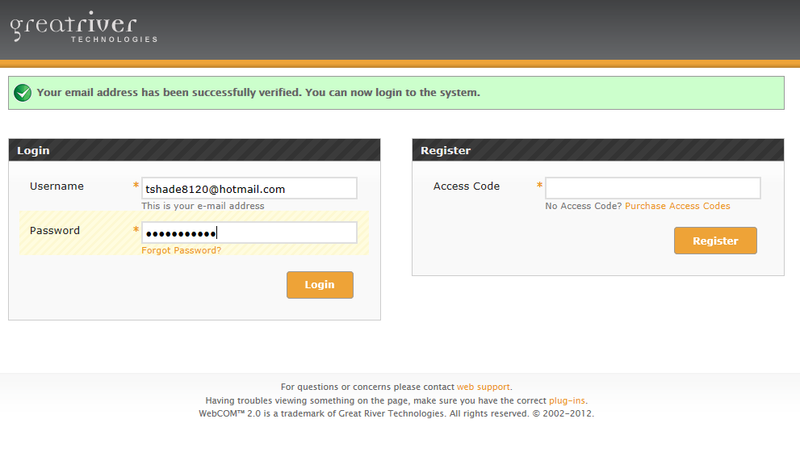 It contains the Access Code you will need to enter when registering the code. 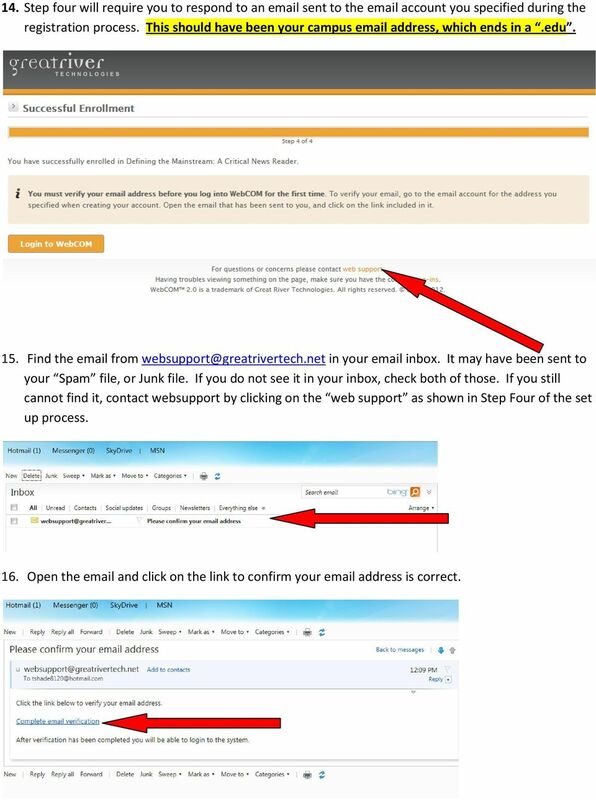 10 The second step in establishing your user account is to verify the publication you are registering for. Click Next if it is correct. Your screen will show the Institution as University of Texas Austin, and an Online Publication Name Introduction to Computer Programming with Python. 13. 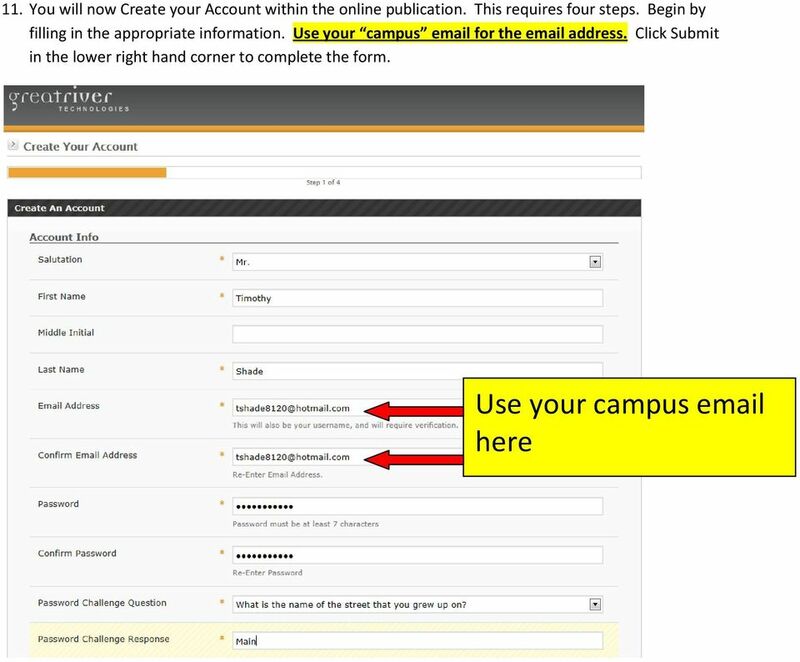 The third step in the account setup process is to select the section of the course that you have registered for. 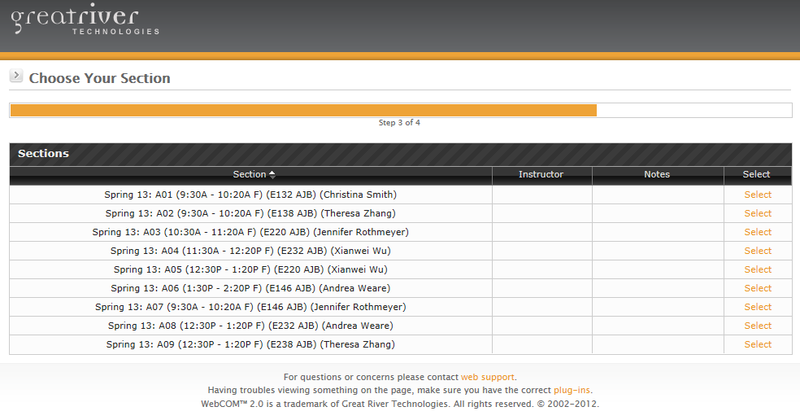 Find the correct section, listed by section number, meeting time, and Instructor. Click Select next to the appropriate section. 11 14. 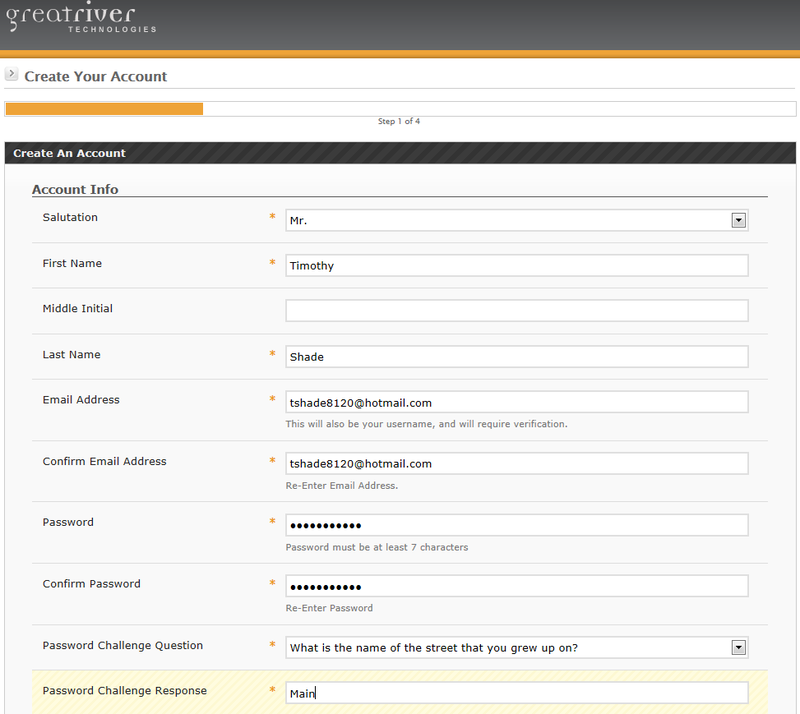 Step four will require you to respond to an sent to the account you specified during the registration process. This should have been your campus address, which ends in a.edu. 15. Find the from in your inbox. It may have been sent to your Spam file, or Junk file. If you do not see it in your inbox, check both of those. If you still cannot find it, contact websupport by clicking on the web support as shown in Step Four of the set up process. 16. Open the and click on the link to confirm your address is correct. 13 Once you have successfully logged into the publication, you should see the first page of Introduction to Computer Programming with Python. Ordering Books Textbooks for Dual Enrollment courses should be ordered online and picked up at the Broward College Bookstore. Using the Online Registration System These instructions show you how to register for classes online from any computer. If you need further assistance, you can contact us by email at seniorservices@co.clayton.ga.us. For technical assistance our webmaster can be reached at web.master@arsha.org. INSTRUCTIONS FOR USING THE ONLINE BILL LOOKUP/BILL PAY Updated: July 2010 August 2010 March 2011 September 2011 June 2013 1. In your web browser s address bar, please type in: www.windsorlocksct.org. 2. Premier and AT&T MicroCell User Guide 2009-2010 AT&T Intellectual Property. All rights reserved. PAGE 1 Table of Contents! What is AT&T MicroCell?! What You Need To Know! Checking Service Availability! 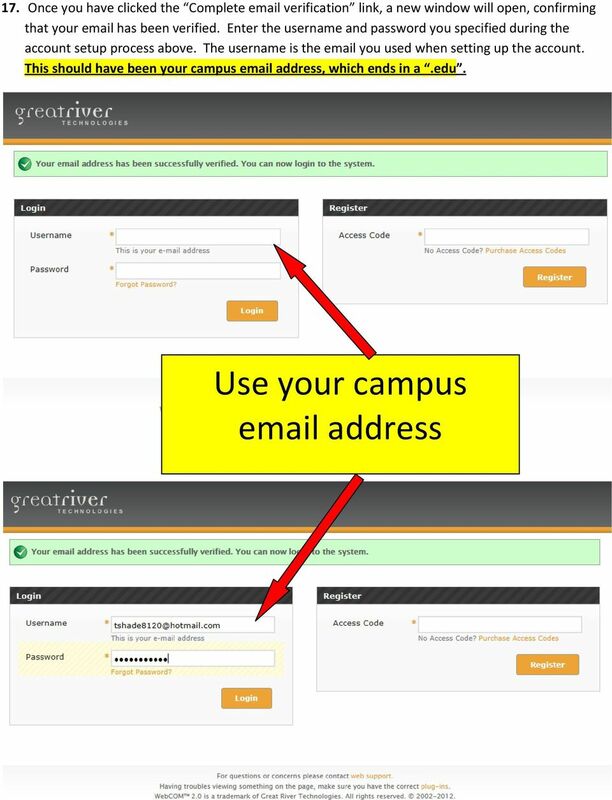 This quick reference guide covers how CSUF students use Titan Online to register for classes.